Frida’s Mexican Beach House was a pleasant surprise. My wife and I are big fans of Mexican food, and this place was absolutely delicious. Their free valet service was also definitely a plus, and – being right on the water – it lives up to the name “beach house.” The ambiance and decor were casual, but not overly so. It’s still a great spot for a romantic dinner while you watch the sun set over the ocean and feel the ocean breeze. The first time we tried Frida’s we didn’t have a reservation, but they found us a table right away. We stayed on the island for 10 days and ate there THREE times. We couldn’t help ourselves. The food is great, the view is amazing, the servers were personal and attentive. The carnitas burrito may be the best I’ve ever had. We loved this place! We made reservations the next two times we went, but arrived a little early to enjoy a drink in the bar first – they have an amazing selection of top-end tequilas and unique cocktails, and the bartenders were always super-friendly and attentive when we went. The stand out star of Frida’s is the salsa. We had numerous refills and wished we could have ordered some to take home to Texas with us. They put goat cheese on the black beans, and it added so much texture and flavor! 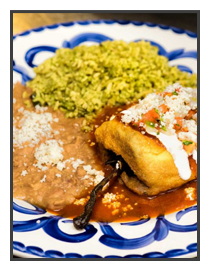 They have some really unique and authentic Mexican fare – and being from Texas, we know the difference between good and GREAT. 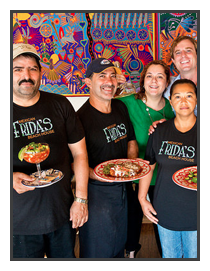 Frida’s is definitely GREAT MEXICAN, and combines a lot of local seafood and farm-fresh items too. We love their moto – “Practice Aloha,” so we bought several of their logo t-shirts to bring home as gifts. I hope you enjoy Frida’s. It’s a great find. You can see their menu online at FridasMaui.com, or call for reservations at (808) 661-1287. Go at sunset!!! !